Is it a giant parrot, or is he actually a tiny orc on a normal sized parrot? Even though Pirate decks are finally good, this card will never see play. Why is that you may wonder? Because it's so slow and weak. Pirates are designed to rush the opponent and benefit from each other since there are hardly any Control Pirates. For Seven Mana just for a 4/6 with Charrrrge, you're better off using Argent Commander instead. The other Pirate Charge minions are also flat out better then Kragg. Patches the Pirate gives you an extra Pirate on the board for free that also fins out your deck, and Southsea Deckhand is sooo much cheaper. Even if Control Pirates became a thing, the cardspace is better suited for something else. You must have forgotten to read his card text. Me after getting him from a pack: "You are, without doubt, the worst pirate I've ever heard of." 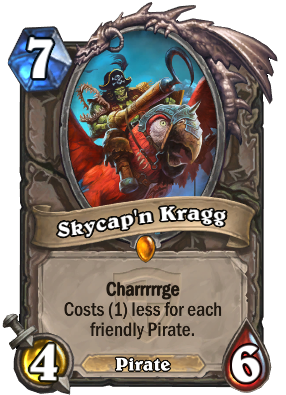 Skycap'n Kragg: "But you have heard of me"
He is actually pretty damn strong. I'm struggling to figure out how happy I should now feel about receiving 50 internet points. The only way this card will ever be viable is if Blizzard makes a Pirate themed expansion or Adventure. You need to have two pirates for this to even pass the vanilla test. Feelsbadman. It's a charge minion though, so you really only need 1 pirate to get vanilla value from it. 2 pirates would make it undercosted for a charge minion with those stats. I got him and a Southsea Captain in Captain Blackheart's Treasure brawl, I won, fast. I have a golden. Should I DE and craft Justicar?